Abohar, in Punjab, became the first city to cross 1,000 orders on the day of launch and has been clocking 2,000 orders a day since then. This was one of the findings of Zomato’s annual report for FY19, which highlighted the food delivery app’s performance over the last year and its plans for the future. 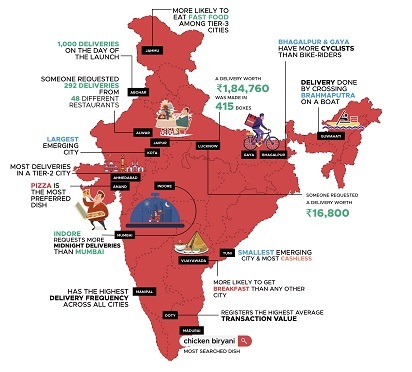 One of the key drivers of this future is its food delivery business which grew from 15 cities to 213 cities in India within a year. Now that Tier-II, III and even Tier-V cities are ordering food online, what’s interesting to notice are the unique food ordering habits across India. Over 100 Zomato delivery partners waiting to pick up their assignments at the Bawarchi restaurant in Hyderabad. Bawarchi typically receives about 2,000 orders a day from Zomato. Zomato currently lists over one lakh restaurants in India and has a last-mile delivery fleet of 1,80,000 partners. Globally, the food tech giant is present in over 10,000 cities, with over 1.4 million active restaurants on the platform.